It’s not because you bathe twice or thrice a day that you’re cleaner than one who bathes once a day. Some people’s nostrils rarely see water in a month or two unless when they have a “running nose”. It’s not because you spend 2hrs bathing that you come out cleaner from the bathroom. Some people have used over 40l of water day in day out, but parts of their backs end up crying foul like the Amba people in +237. It’s not because you wear a suit that you’re most sophisticated compared to one who wears a T-shirt. Trust me, if you look at their shirt collars, you may decide never to sit behind one during a seminar. It’s not because you walk “clean” that you actually are. Believe me, most junkies out there are in their Christmas wears all the time. With all due respect, it’s not because you are adorned with high religious titles that you have a living relationship with our Heavenly Father. It’s also not because you have all the academic grades and titles that you’re necessarily an erudite in the domain. Else ask my people and they’ll tell you the technological mystery of 32/500. What am I trying to say? Do not judge a book by its cover. This statement means you gotta judge. 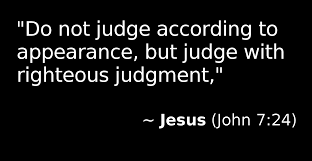 With righteous judgement, JESUS says. Judge righteously. Do not judge by mere appearances. Look deeper, farther than what the cover shows. Most good books are rarely discovered on the cover. We don’t do that with books. Why do we want to comfortably do so with fellow humans. So yes, I won’t say don’t judge, as is the maxim out in our confused world today. And please, it’s not my gospel. It is the B.I.B.L.E. Jesus said the measure you judge with, with that you’d be judged also. His caution of “do not judge” as interpreted mostly today, is for those who fear for skeletons to be seen in their cupboards. When Jesus speaks in Matthew 7:1-5, He says when you want to judge, make sure you have taken out the speck out in your own eye first, before you claim you can comfortably see that which is in your brother’s. Else, you’ll be a hypocrite. In essence, Jesus wasn’t about judging in this portion. He was about HYPOCRISY. Well, maybe it’s time we stop taking His words out of context to suit our personal whims and caprices. If you see unrighteousness and do not judge righteously, then certainly you are guilty of same and thus fear being judged likewise. Key is, just as we say out here “he who comes to equity must come with clean hands”. Likewise, you going out to judge righteously must be doing so with clean hands, with a clean heart. Not judging to shame the person, or unto condemnation or pride, but unto love, compassion and repentance so we all revel in the same grace of God for mankind. Mind you, we all were/are sinners. Christ didn’t come so we die in condemnation. No. He came so we look at ourselves through Him, see our sins forgiven and die through Him, and see our new selves resurrected in Him. So brothers and sisters, let’s get into this mire of a world and bring in God’s righteousness, in love and compassion. Not forgetting that “he who comes to equity. ..”. And go ye out, boldly, not to judge the book by its cover, but in all righteousness, with the love of God in our hearts, lips and hands. Posted on January 25, 2018, in compassion, loving others, On Christianity, On Judging Others and tagged Jesus, judging, judging others, love, mind's seat. Bookmark the permalink. Leave a comment.